One of the main features of the Regal 1900 is its generous swim platform. It's huge , occupies the entire width of the boat, and has a corridor that reaches the cockpit directly. It is an ideal place for sunbathing , it also makes great wakes for watersports. 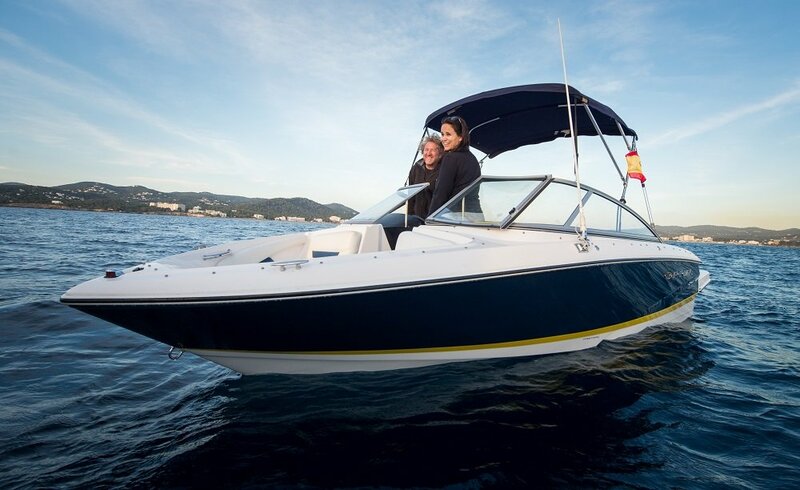 Our rental motor boat Regal 1900 has lots of space for sunbathing. When anchored in a beautiful cove in Ibiza, there are two seats at the bow where you can soak up the sun. There is also a spacious sundeck at the aft. This rental boat in Ibiza carries a Volvo Penta engine with 145 hp . It is low power consumption model. Engine power and boat design make it ideal for water sports such as water skiing and wake boarding. If you rent this hire boat remember that we have various accessories to enhance your experience; wake boards, skis and inflatables.